Opening it's doors on December 15, 1927, the 3-storied building was originally called El Torreon (The Turret) and became a focal point for the Kansas City Jazz scene. Big Band and Jazz greats such as Duke Ellington, Count Basie, and Cab Calloway all performed at the historic venue. "The El Torreon sported a Spanish Mission motif with floating clouds and glittering stars on the ceiling accentuating the exotic atmosphere of a Spanish courtyard. A "crystal ball" with 100,000 mirrors illuminated a dance floor that could accommodate 2,000 dancers." -- Club Kaycee. The place has undergone several revisions since it's grand opening. In 1936 the El Torreon became the Avalon Supper Club and then in the early sixties, the El Torreon Roller Rink. By 1971 the building had returned to it's musical roots and become the popular rock and roll venue, the Cowtown Ballroom. With the mirrored ball still suspended from its historic ceiling (*note: the mirrored ball was later donated to the Kansas City Museum in 1978), the mostly seat-less venue lended itself to a near festival like atmosphere, with concertgoers pulling up a blanket or quilt and staking out their bit of floor space to watch the show. The first show was on July 16, 1971, a concert by the Flying Burrito Brothers, and the Ballroom would host a wide variety of Rock 'n Roll acts before it would close down for good on September 16, 1974. Rory Gallagher, Nitty Gritty Dirt Band, Frank Zappa and the Mothers of Invention, Grateful Dead, and King Crimson were just a few of the name bands that performed there. The building still stands today. Until recently the downstairs was being used for Nite Club acts, small concerts, and practice space for musicians with the famous upstairs ballroom being used as a storage facility for the most recent owners of the building. Unfortunately, at this writing, the El Torreon Ballroom has shut its doors, and it is unknown whether the famous ballroom will ever return to its former glory. The Cowtown Ballroom refuses to be forgotten however, and there is a documentary film being made about the legendary venue titled, 'Cowtown Ballroom: Sweet Jesus' planned for release in the spring of 2009. 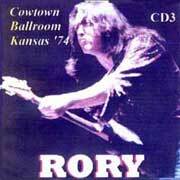 Although it's listed on the bootleg jacket that Rory performed at the Cowtown Ballroom in August of 1974, probably the concert was given several months earlier. An image of the concert ticket stub found on a Kansas City memorabilia web site gives the concert date as Sunday evening, March 24, 1974. The opening act for the show was a regional favorite, "Tide", fronted by guitar slinger Jim Stringer, and recently inducted into the Kansas City Hall of Fame. Special thanks go to Brenda O'Brien for finding this ticket stub. Whatever the actual date of the concert, Rory gives a timeless performance that makes this bootleg concert one of the finest live recordings out there. I remember that concert. Jim (Strider) had left the band. We had a female singer named Becky Reed who cried after our set because the crowd kept yelling for Rory. I remember being impressed by how good Rory played and sang. That was how rock �n� roll was supposed to sound. This is one of my favorite bootlegs. Each song is a gem. Vote for your favorite bootleg.